Prototype aircraft for the D 9 - series. 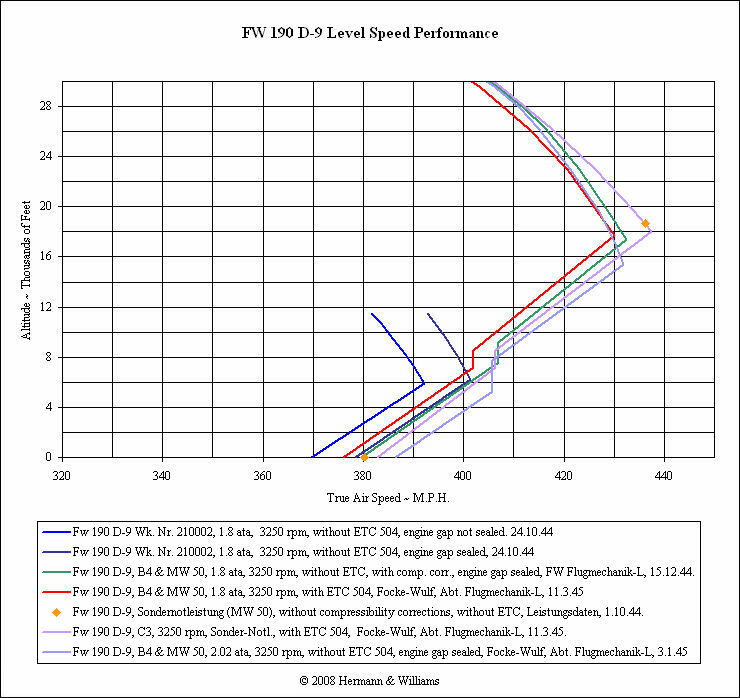 VS 9 - Propeller 9-30337.10. Radiator flaps opening deflection limited to 20°. Armament: two MG 131, 4 MG 151 without ammunition. 6-liter pump for hydraulic opening flaps to 12.6. 12-liter Barmagpumpe for hydraulic opening flaps 12.6. /. 22.6. Hydraulic opening flaps of air compression circuit connected from 22.6. Short intake hood with 70 mm spacing. Rear offset jet nozzle in order to avoid a strong heating of the oil tank to the outside. Erhard altitude fuel tank pumps. Elevator differential 1: 1.5 up to 8.7. Elevator differential 1: 1.65 to 8.7. Elevator (295 deep) with thickened horn equalization (parabolic horn) from 8.7. Rudder differential 1: 8.1 to 7.8. Rudder bell crank for 20° rudder deflection from 8.7. Cabin ventilation is connected to engine cannon. Take-off weight G = 4070 kg, S-location = o.56 m.
2. Airspeed calibration on the test course. 4. Rate of climb with combat power. 5. Cooling capacities in the climb. 6. Assessment of the rudder forces and flight characteristics. 7. Examination of the split flaps hydraulic system. 8. Pressures in the FT-Raum at various flight conditions. 3. The level speeds at altitudes up to 10000 m were obtained with combat power (n = 3000 rpm / min) and are shown in Graph 3, with ram pressure and compressibility taken into account. As can be seen, the full throttle height of 6100 m is considerably lower compared to the V 17 and V 20. It is noteworthy that shortly after delivery of the machine on 28.6. values obtained in flight at altitude were better, but were not confirmed by further flights. An examination of the engine and supercharger brought no explanation for these differences. Top speed obtained in this low full throttle height is TAS = 406 mph (654 km / h). 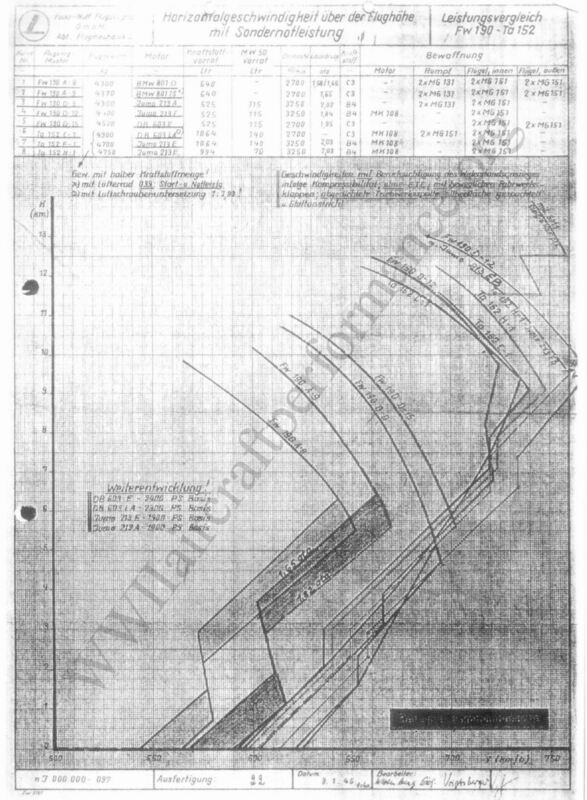 Since the non-standard production wing outer cannon and a front windscreen flap for MG 151 are installed, an increase of the level speeds is expected to be determined. 4. The climb flight to determine the rate of climb was carried out with combat power and a flying weight of 4070 kg. A 20° radiator flap opening position results in a service ceiling of 11100 m. As with the level flight - full throttle height, so is the boost pressure drop with 5500 m altitude very low. Compared to the values specified by the engine manufacturer, no ram utilization is therefore available in the climb. The influence of the outside air temperature should be low because the course deviates only slightly from tcina. Boost pressure, fuel consumption and rate of climb are shown on Graph 4. D-9 series condition, normal surface without special treatment. Armament: 2 MG 131, 2 MG 151. Radiator flap in front of the air intake fixed in flush position. Lenghtened air intake 20.9 to 28.9. Radiator flap control governor attached to propeller pressure circuit. Rücköl vom VDM – Regler fliesst zum (Sauganschluss) des Luftschraubenreglers zurück. 3. Investigations for improvement in climb. 4. Checking the governing action of the radiator flaps. 1. 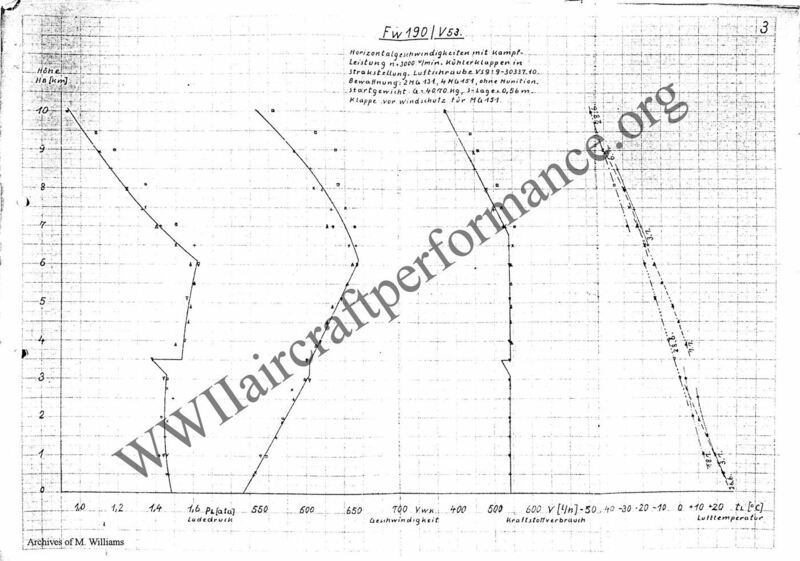 The test flights determined the airspeed indicator error for an Eltron and a Bruhn pitot tube with equal dimensions. In contrast to the Bruhn pitot tube, the compressibility error of the Eltron tube, as deliverd with 3 d slot distance, is considered very large, particularly with level speeds. A Bruhn tube is consequently more appropriate for test flights. 2. The airplane was measured for speed using combat and take-off power. The following speeds were obtained without ETC and with main (operable) wheel doors: 398 mph (641 km/h) at combat power with a full throttle height of 19,357 feet (5900 m) and 413 mph (665 km/h) at take-off power with a full throttle height of 20,177 feet (6150 m). The radiator flaps were set on flush postion (Strakstellung) during these flights. Only a small reduction in full throttle height (~100 m) occurs by completely opening all radiator flaps up to the non-powered flap, in front of the air intake in flush position setting, while the level speed is reduced by approximately 32 mph (50 km/h). Speeds increase 9 to 10 mph (15 to 16 km/h) below and 17 to 18 mph (28 to 29 km/h) above full throttle height, with the change from combat to take-off power. The first engine failed from supercharger damage after a short period of operation. The lattice filter built into the air intake broke and parts of it dropped into the supercharger. The second engine also suffered supercharger damage. The cause here is unknown. The C-engine, Serial Nr. 1001580035, from the failed V-53 and measured on the Jumo altitude test bed, was inserted as a replacement. 3. Climb FTH (Abfallhöhe)3 could be increased over ~ 700 m with this machine by a fixed setting of the non-powered radiator flap in front of the air intake. Like the further trials, e.g. Durchsteigen of the full throttle height with completely closed flaps (bezw. ), extension of the air intake up to the point of the radiator flap swivel axis position (according to photo NR. 20027) showed a further improvement is not possible and the above-mentioned change is sufficient for performance improvement. 4. Except for the first inexplicable difference of 5° in the lubricant temperature gradients, no change of the engine temperatures was found in combat power climb due to air intake flap setting. These temperatures so far are large relative to 213 A. 1. Bewegliche Radklappen: When the ETC was fitted, together with bomb or drop tank, the doors couldn't be fully opened, so hinged panels to direct the exhaust gases and to cover the area around the main wheel, were fitted and fixed in place. 2. Meßstreckenflüge: refers to a test over a distance on the ground, usually in both directions and in right angle to the original direction to eliminate the influence of wind. 3. Abfallhöhe: „FTH“ or literally translated „fall off altitude“ The height above which the charger can’t keep the boost pressure up to it’s rated value. Max. Radiator flap opening angle of 20 °. New Erhard valve with 08/2.0 atü setting. Radiator flap control governor attached at propeller pressure circuit. 1. Determination of the Abfallhöhe, full throttle height and level speeds with the performance-tested engine. 2. 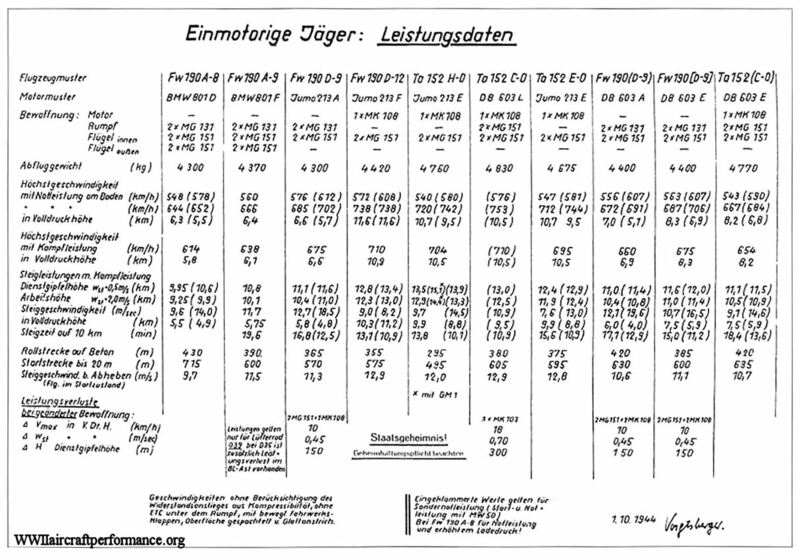 Record of the engine temperatures in climb. 3. Measurement of the weapon heating system. 1. The airplane could not be tested with engine No. 1001580035, which was measured on the altitude test bed. This engine failed on 1.10 due to leaky cylinder block packing. The boost pressure and level speeds were measured to 19,685 feet (6000 m). It was shown, with the radiatior flap in front of the air intake in flush position, that the full boost pressure available had not been reached; thus the FTH (Abfallhöhe). Current engines reach a FTH (Abfallhöhe) of 18,372 to 18701 feet (5600./. 5700 m) at the maximum; the results of Flight Report Nr 2 of 190/V-53 being extraordinarily good. In level flight the airplane reached speeds slightly slower (~3 to 5 mph - 5./. 8 km/h) compared with this airframe and engine Serial Nr. 1021520539. The gear change height (Umschalthöhe) of 7,874 feet (2400 m) for the test flight was much too low. 2. The radiator coolant inlet and outlet temperatures, as well as the lubricant and supercharger air temperatures at the engine entrance, were taken using combat power climb with 20° angle radiator flap opening. Since the last flight had to be broken off because of weather and engine breakdown, the height of peak temperature temperaturumkehrhöhe was just reached at 19,685 feet (6000 m) altitude. 3. The tests of the warm air weapon heating could not be finished due to engine damage. Production exhaust manifolds were not fitted, therefore, for later tests, the few existing results of the VA-ME are consulted for comparison purposes. Combat Power - 3000 rpm, without ETC 504, normal finish, weight = 9,038 lbs. Erhard pressure retaining valve "B"
1. Determination of level speeds after improvement of the surface quality and sealing of the engine gap. 2. Measurement of climb with radiator flap in standard position for 100 ° coolant temperature. Engine 0465, a replacement for engine 0035, failed after a small amount of flying time from a water leak. The few sea level speed values obtained correspond to expectations and lie, according to the speeds determined with Wk Nr 210002, only ~ 3 mph (5 km/h) below calculated performance. The subsequent engine - 2229, however, resulted in poor speeds, as evident by the performance curve. At combat power, about 6 to 7½ mph (10 to 12 km/h) is lacking below FTH, while above, the difference becomes substantially greater due to the low FTH and the high drop off. These level speeds are thus not useful for comparison purposes. Finally, if engine performance corresponds reasonably well to book values, D-9 airplanes, with well prepared surface and sealed gaps at the engine, achieve speeds just short of the calculated values. 2. 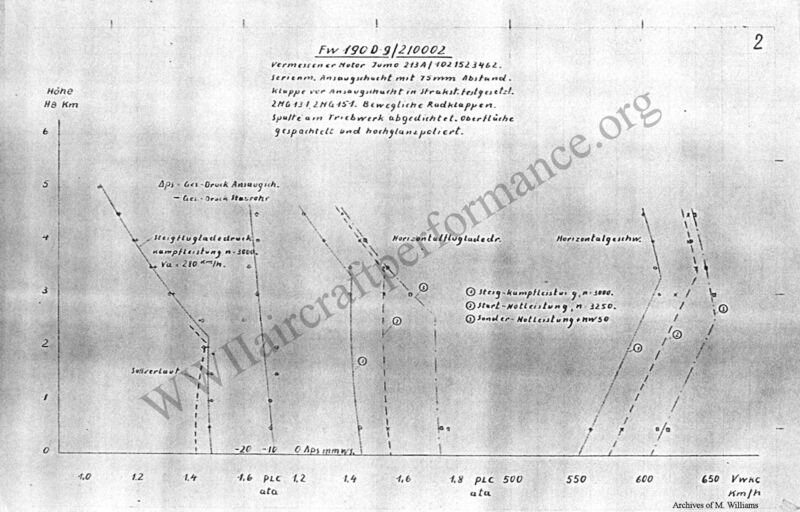 Graph 3 shows the rates of climb reached at combat power with standard 100° position of the radiator flaps. The service ceiling was derived by extrapolating from the climbing performance curve from 32,808 to 35,104 feet (10 km to 10700 m.). 3. A sheet metal seal after KBV 40963 was made at the wing/fuselage trasition area in place of the easily destroyed rubber strips. Similarly, the seal after KBV 40957 tested on W. Nr. 210002, also failed. Da die Blechfahnen zur kurz ausgeführt sind, werden sie aus dem Spalt herausgezogen, zerdrückt und stark angescheuert. The machine is delivered after the firing trials, with the strengthened overhead panel, was concluded without objection. 404 mph at 19,685 ft. (FTH) 362 mph at 4,922 ft.
Radiator flap in front of the air intake fixed in flush position from 18.9. Long intake scoop (Eintritt bis zur Kühler klappendrehachse vorgezogen). 29.9 ./. 1.10. 1. Dynamic pressure calibrated over the test range (Maßstrecke). a). With ETC 504 and fixed landing gear doors. b). Without ETC 504 and with operable landing gear doors. 3. Check of the manifold pressure pattern with flush postion setting of radiator flap in front of the air intake. 4. Climb performance at full flying weight. 5. Coolant and lubricant temperatures while climbing at combat power. 1. Determination of position error has been carried out over the test range (Maßstrecke) using the Eltron pitot tube as delivered. The enclosed graph shows the error, in the common speed range, with and without consideration of compressibility. 2. Level speeds were determined for combat (n = 3000 rpm) and take-off power (n = 3250 rpm) from 8 bezw 9,5 km high, with the radiator flaps in Sträke position. Maximum speed at combat power, with ETC 504 and fixed wheel covers, was 391 mph (630 km/h) at 19,028 feet (FTH) (5800 m.) . At take-off power and as delivered with ETC 504, 407 mph (655 km/h) was reached at 19,849 feet FTH (6050 m). An improvement of 5 to 6 mph (8 to 10 km/h) resulted through removal of the ETC 504 and replacement of the fixed with the main (movable) wheel doors. Despite the high surface quality of the machine, speeds at full throttle height were ~ 9 mph (15 km/h) below calculated values. Speeds were no higher than Werk Nr. 210001, which did not have special surface treatment. The influence of a smoothed surface is checked by the treatment of 210001. The speed spread between combat and take-off power with this machine falls ~12 to 13.5 mph (20 to 22 km/h) under and ~15.5 to 17 mph (25 to 28 km/h) over full throttle height. Since the engine is from the first batch, and the supercharger consequently received no special treatment, the full throttle height lies over ~ 1,312 feet (400 m) too low. 3. By fixed setting of the non-powered radiator flaps before the air intake in flush position (on 20 mm) an improvement in the full throttle height of around 700 m could be obtained in the climb, when all remaining radiator flaps were fully opened. Hiermit ist nahezu das Optimum erreicht, da durch Schließen aller Drehachse der Kühlerklappen keine wesentlich, grössere Abfallhöhe ermittelt werden konnte. Über diese und weitere Versuche mit bezw. ohne Strahldüsenabdeckblech erscheint ein Sonderbericht mit genauen Angeben der erflogen Werte einschl. Ladelufttemperatur. 4. 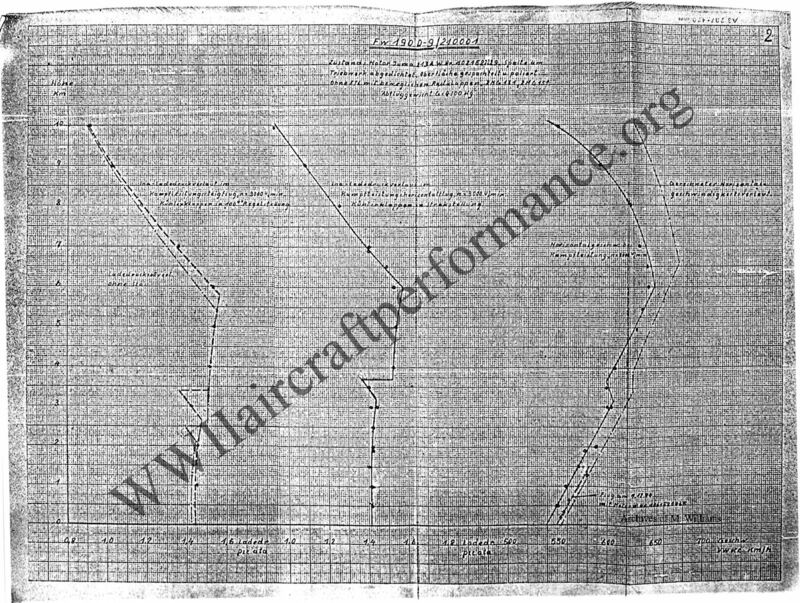 Climb at combat power, represented on the enclosed graph, was accomplished with full D-9 flying weight of 9,480 lbs. (g = 4300 kg). The radiator flap in front of the air intake, and all remaining flaps, were set to flush position from 9 km to 10000 m. At 29,527 feet (9000 m) all radiator flaps were set on flush, whereby an increase of over ~ 2 m/sec in the rate of climb as well as an increase of the service ceiling to 34,448 feet (10500 m.) could be obtained. Coolant temperature, radiator entrance tKE = 114° (related to teina + 26°). Lubricant temperature, engine entrance töME = 130 ./. 132° (related to teina +21°). tKE = 115° (teina + 26°). töME = 131° (teina +21°). Therefore the radiator quality is not affected to any measurable degree by the Querachnittsverengung (vergl. F.W. 190/210001). It is remarkable that this engine shows around 10° higher coolant temperature than has previously been measured on a 213 A .
Methanol equipment with 160 ltr. Nozzle with 0.45 atu jet pressure. Rücköl vom VDM – Regler zum Sauganschluss des Luftschraubenreglers geführt. The two possibilites for increasing output can be examined through simultaneous testing. The take-off power boost pressure adjusted around 0.2./. 0.22 ata higher for the trials from 1.52 ata at the MBG . In the case of methanol installation, the further increase of around 0.7 ./. 0.1 ata arose as a normal result of the connecting equipment. Wie aus der Auftragung ersichtlich; entsprach die Zuordnung bei den Flügen 1 und 2 am 12. und 14.10. nicht ganz den Soll werten. For the 1900 PS – power, the boost pressure below full throttle height, pLC = 1,75 ata, lay too high and for methanol operation with pLC 1,77, somewhat too low. Therefore, the speed increases of ΔVa = ~12 mph (20 km/h) (for 1900 HP) and ΔVb = ~20.5 mph (33 km/h) (for methanol) are to be used. After repeated adjustment, the maximum boost pressures lay in the correct range during flight 3 on 14.10, i.e. 1.7 ata for 1900 PS and 1.8 ata for methanol. Based on the flight results, and allowing for variations, it can be stated that a gain in speed of 10 to 11 mph (16 to 18 km/h) is obtained below full throttle height using take-off power increased to 1900 PS. 20 ½ to 21 ¾ mph (33 to 35 km/h) can be obtained using MW 50 installation, with the 160 Ltr. - nozzle. The supercharger air temperatures were reduced ~ 35°, with the change from 1900 PS power to methanol operation. All gaps at the engine and the transitions carefully sealed with rubber. Non-powered radiator flap in front of the air intake fixed in flush position. Radiator flap adjustment equipment attached to the propeller oil circulation. Rücklauföl zum Sauganschl. des Luftschraubenreglers geführt. Stromlinienverkleidung für Bildgeräte Schrägeinbau an der linken Rumpfseitenwand. 1. Determination of the gain in speed in flight, with increased Take-off and Special Emergency Power, by seals at the engine gap. 2. Check of the flight characteristics with Verkleidung für Bildgeräte Schrägeinbau. 1. As delivered, substantial gaps were present at the engine, in particular in the transition from the cowl to the wing. 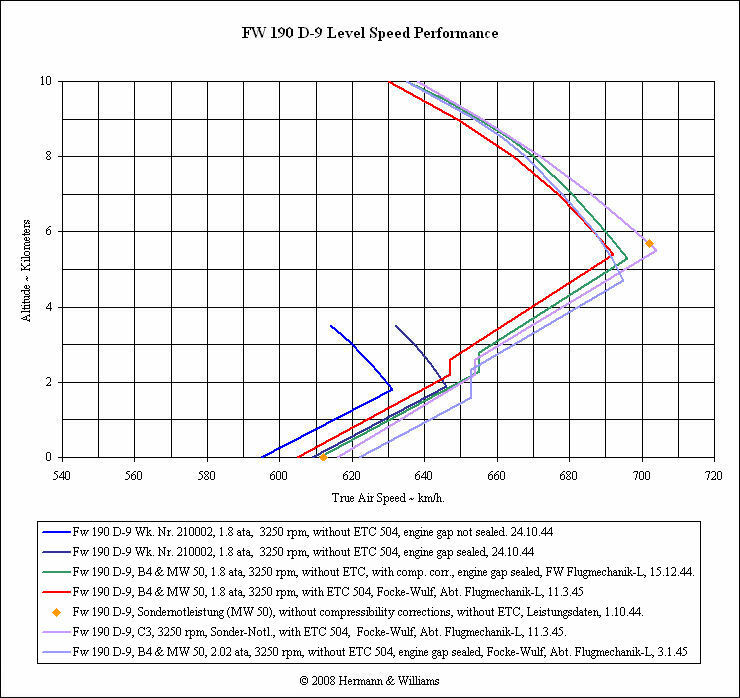 In order to check for their influence on level speeds, performance comparison flights were carried out in the low supercharger range, before and after sealing of all existing gaps. After conclusion of the trials in the initial condition, an even gap width at the transition from the cowl to the wing had to be ensured, first by shifting of the lower engine cover against the propeller direction of rotation, since substantial differences arose by the engine torque in flight. Then the sealing of the fairing was made by means of rubber gaskets and metal strips. During these flights the seals between engine and wings pulled out and then were torn off. It was also noticed that exhaust gases caused minor fire in spots. Therefore, an improvement of the sealing within this area is necessary. 2. Bei Start und Landung sowie im normalen Horizontalflug ist durch den Bildgerätetropfen an der linken Rumpfseitenwandkeine Beeinträchtigung des Abkippverhaltens im Geradeaus- und Kurvenflug unterblieb zunächst, da das Flugzeug infolge abgerissener Strahl düsen aus dem Flugbetrieb gezogen werden musste. Jumo calibrated (Vermessener) engine 213 A/1021523462 with supercharger Nr. 1025755295. Standard intake with 75 mm clearance. Engine gap sealed at the wing-fuselage transition after KBV 40957. Armament: 2 MG 131, 2 MG 151 without ammunition. Conti-Perlon tire for main landing gear 20.1. ./. 16.2. Fuel feeder line with shut-off valve as with 190 A as of 12.12. 1. Check of the tuning and power of the engine measured on the Jumo high test stand. 2. Evaluation of the engine gap sealing. 3. Testing of the Conti tail wheel and main landing gear tires. 4. Contamination of the photo equipment plate with deflector in flight operation. 1. Due to the fact that generally with Jumo-213 A engines a full throttle height ~ 400 m too low results, it should be checked with a measured (vermessenen) engine. For this purpose, following the loss on the test stand of the C-engine 1001580035 the likewise measured A-engine, W. Nr. 1021523462 was here fitted and flown in Fw 190/210001. Without new adjustments to engine control gears over the RPMs, total boost pressure regime displays perfect values up to the lower range, so that the adjustments made with the Jumo can be regarded as good and no change experienced with the mounting of the engine to the fuselage (Chart 10). 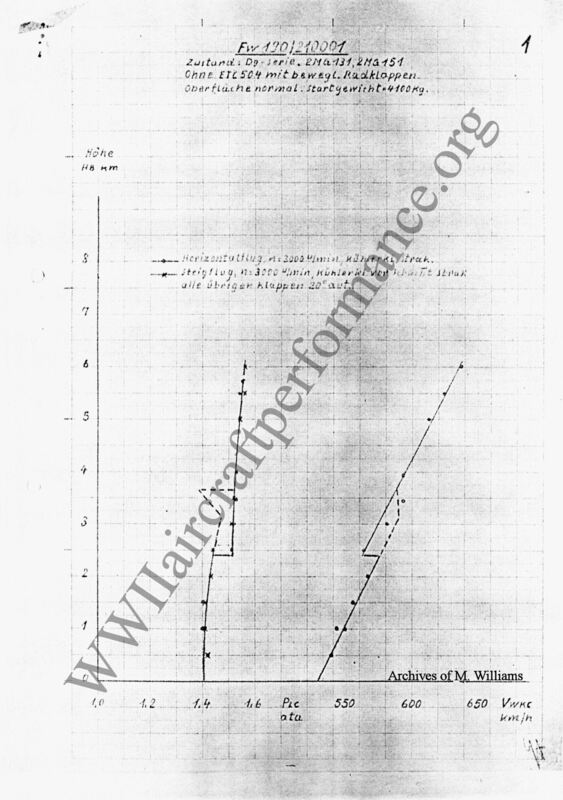 However, after addition of the connecting equipment necessary for methanol operation was already below combat performance, recorded on the enclosed graph (Graph 1 b, 1 C), as well as the boost pressure increase for MW 50 – operation no more the required behavior adequate. An improvement could have been obtained only by replacement of the MBG, according to a statement from the Jumo mechanics. 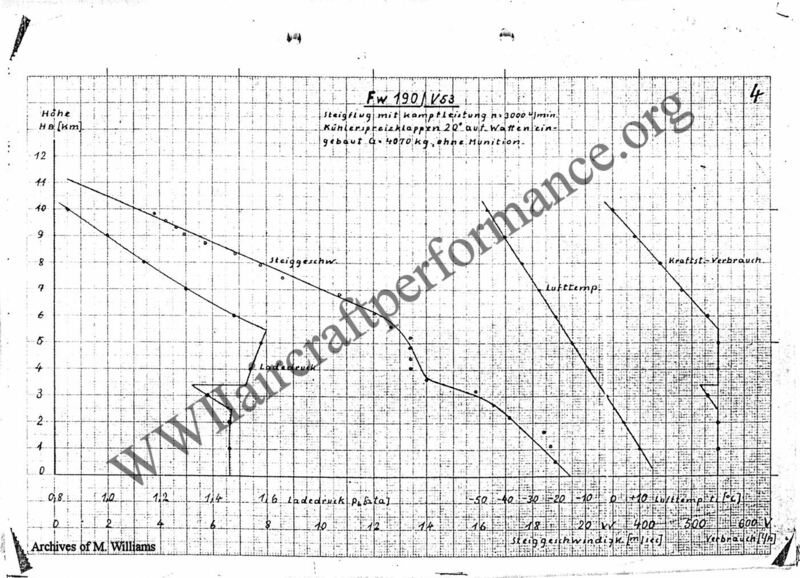 Thereupon was waived and Graph 2 shows calculated level speeds with Combat, Take-off and Emergency power. Since the engine did not shift to high gear and already failed on 16.2, (cylinders 6, 9 and 10 no compression) the measurement could only be conducted in low gear. 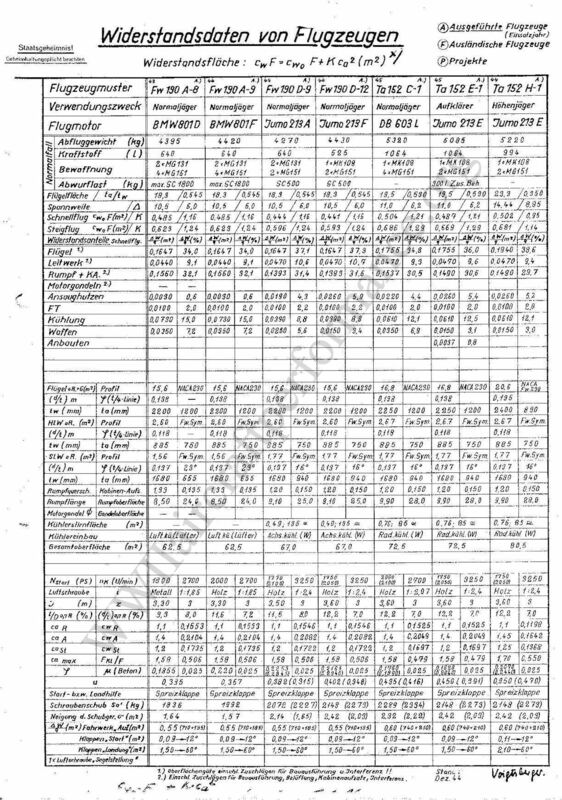 However, although according to the Jumo test stand report the engine conforms to the book values, yet it is shown here that the full throttle height, compared with earlier measurements with the untested engine W.-Nr. 1021521862 (Flight Report Nr. 1), has experienced no improvement in climb and only a small improvement in level flight. The following table summarizes the low gear values reached to date. 2. The gain in speed of ~9 mph (15 km/h), previously reached through the sealing of the engine cowling gap, was confirmed. The installation of a sheet metal seal after KBV 40957 improved durability at the location where the rubber seal reached the fuselage-wing transition area. This was unsatisfactory, since it was already strongly scoured after a few flights and not resilient enough to fit again to the cowling after strong engine buffeting. 3. The Typhoon tail wheel tire (double profile), copied by the company Conti, was evaluated for flutter behaviour with tail wheel locked. It was established that the behavior is equivalent to the original tire through take-offs and landings on a concrete runway. Flutter did not occur, only after touch down for landing were some quick fading lateral movement oscillations noticed. With the installation of the tire into the tail wheel fork, insufficient free movement was available in the upper area, so that the fork had to be indented. So far 50 takeoffs and landings on grass and concrete runways have been conducted with the Conti Perlon tire for the main landing gear without significant damage to the tire surface. The increase lies within the expected permissible limits. The trials are continued. 4. The straight deflector, which was delivered without a description, ahead of the photo equipment plate at the fairing for the oblique camera installation has a strong contamination of the plate due to exhaust gases and in particular water spray can not be prevented. It is suggested to use a sliding cover. Addendum: A closer examination of the engine resulted in strong supercharger damage, which is to be regarded as a primary cause for the loss. Whether this damage was caused by foreign objects or material defects, can not be decided from here. 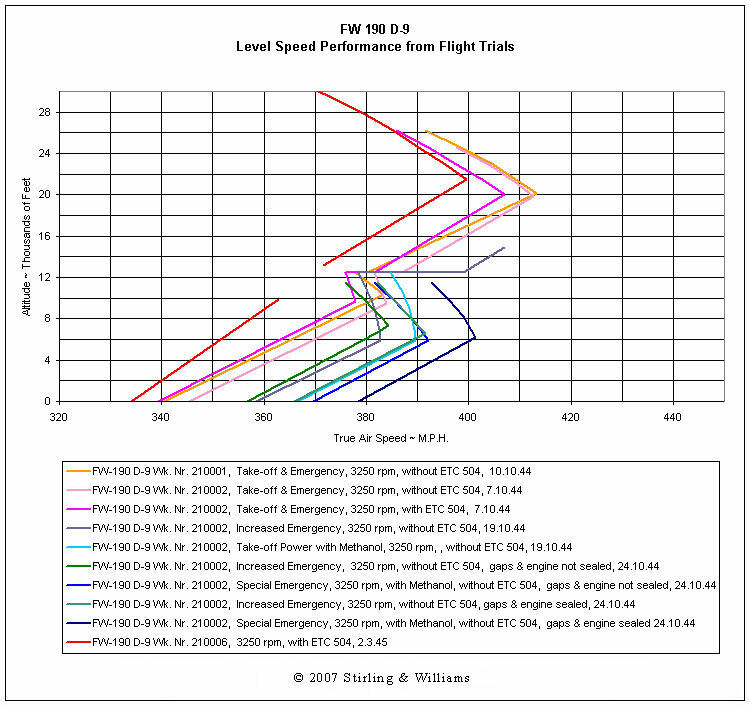 Flight performance of the Fw. 190 D-9 (production version) is given. Speed at altitude was flown with Serial Nr. 006. Various aircraft were checked at 3,000 rpm during continuous testing. Speeds reached 323 to 329 mph (520 to 530 km/h) at sea level and 388 to 395 mph (625 and 635km/h) at 21,325 ft (6.5 km) (about full throttle height, depending on engine adjustment). With 3250 rpm, speeds reached 335 to 342 (540 and 550 km/h) at sea level and 401 to 407 mph (645 and 655 km/h) at 21,653 feet (6.6 km). With 3250 rpm and a take-off weight of 9,480 lbs (4,300 kg), rate of climb was 3,329 ft/min (17.0 m/s) at sea level and 392 ft/min (2.0 m/s) at 33,465 feet (10.2 km). Standard version with ETC 504 (without wheel cover). : 2 mg 151 in the wing with 250 rounds. Fuel contents: 141 gallons (640 liter), of which 25 gallons (115 liter) is in the supplementary fuselage tank. 10,229 lbs. (4640 kg), if flown with 300 liter drop tank. Speeds were ascertained from dynamic pressure tests. Calibrated measuring instruments were used. The interesting Va-area was reached by flight measuring on the test range. The rates of climb were measured with a carbon recorder. III. Results of the tests. The results are on graphs 5 to 9. The level speeds were reached with different engine rpms. It is remarkable that speeds were around 9 mph (15 km/h) higher in the past with Serial Nr. 006 at 3000 rpm (see report of 15.11.44). The current speeds were reached after installation of a new engine, correct engine adjustment, and with the standard propeller. Performance shown in the report of 15.11.44 was determined, through continuous testing, with an unadjusted engine and a D-12 propeller. The speed loss is therefore from engine and propeller differences (D 9 and D 12 propeller). 1.) Level Speeds. They are shown on sheet 5 and apply to a nominal weight of 9,259 lbs. (4200 kg). The V curves are drawn in throughout the entire speed range, so that one can read off the associated Va at each height to each Vw. 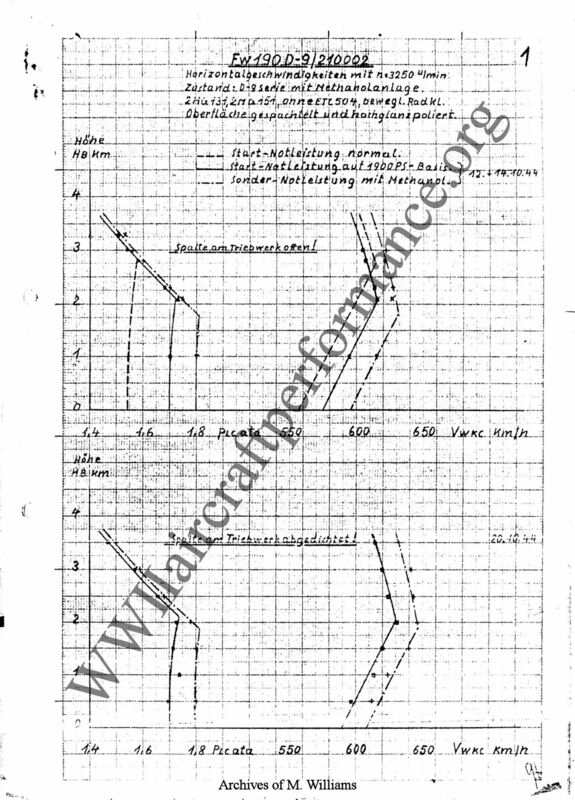 Sheet 6 shows the dependence of the airspeed on the flying weight and sheet 7 the influence of a 66 gallon (300 l) external tank on the speed. Search: Speed at 26,246 feet with a weight of 9,700 lbs, 66 gallon drop tank height, and 2300 rpm. The final Va = 380 km/h is registered on sheet 5 (H = 6 km.) Point V and perpendicularly under V on H = 0 km, in the example looked for Vw = 506 km/h read off, point VI. 3.) Radiator flap test flight. The influence of the radiator flap position on speed (with empty drop tank) was determined at 6,562 feet with 2700 rpm, (see sheet 7, Fig.e). The entire opening was divided into 10 equal parts, "0 = completely down" and "10 = completely up". The test shows that the speeds are greatest with a 2,3 radiator flap position (approx. flush), i.e. the speed loss is lowest. If possible, level flight should be flown at this position. Now lets come to the interpretation as to why both Wk.-Nr. 001 & 002 generally fall short of calculated values. The first problem with all flight trials of Wk.-Nr. 001 & 002 is that they were done with the initial batch of production engines, which have well documented problems with supercharger performance. Those first production engines produced 60-100PS less than the book values used for performance calculations. The second problem is the engine gap. The drag data for the D9 most likely comes from scale models; those models will not have the engine gap as they are "carved out of one piece of wood". The scale model, therefore, has a smoother surface than the real airplane. The speed increase in the tests, where the gap was sealed, support this assumption. 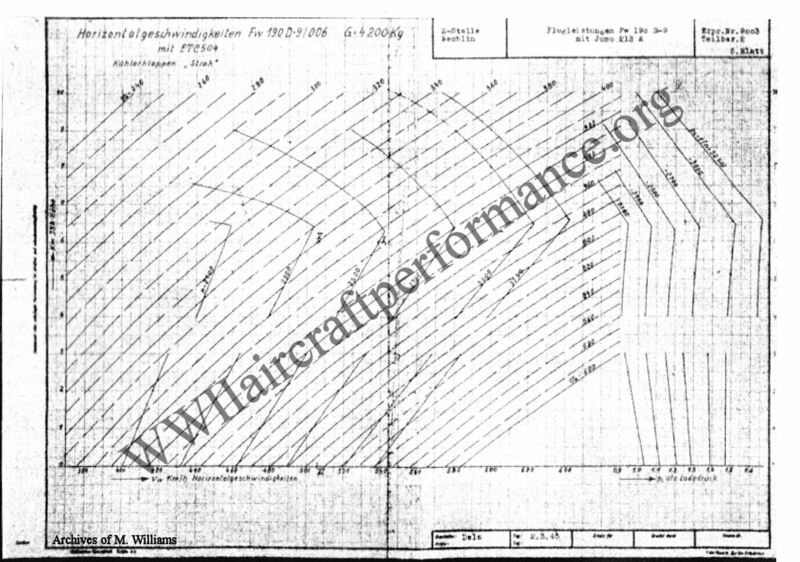 Nevertheless, the tests are representative of performance for operational Fw 190 D9s. As best as can be determined, the engine gap seal was never introduced into serial production due to rubber shortages. It should be noted however, that operational planes with a good surface finish and an engine running to book values will perform better than both Wk.-Nr. 001 & 002. This is supported by the few speed runs with the JUMO 213A tested on the bench. Now lets examine the “Erhöhte Notleistung” and “MW50” speed runs. When looking at the results, we must keep in mind that Wk.-Nr. 002 was specially rigged for those runs to enable the testing of both settings in one airplane. Wk.-Nr. 002 engine installation was therefore not in a standard production condition when carrying out those speed runs. Standard production planes had either “Erhöhte Notleistung” or “MW-50” available, not both. The surface finish and other equipment of Wk.-Nr. 002 during this test is the equivalent of a standard production plane. Report #2 focuses on the speed increase through “Erhöhte Notleistung” and “MW-50” compared to Take-Off/Emergency rating. Report #3 examines in detail the speed increase from sealing the engine gap, but the tests were only carried out up to 3,6km. The bottom line for those reports is that they provide us with a good overview of how the “Erhöhte Notleistung” or “MW50” boosted performance, but only up to ~3,6km. The speeds attained, without engine sealing, between SL and 3,6km can be considered representative for operational aircraft. 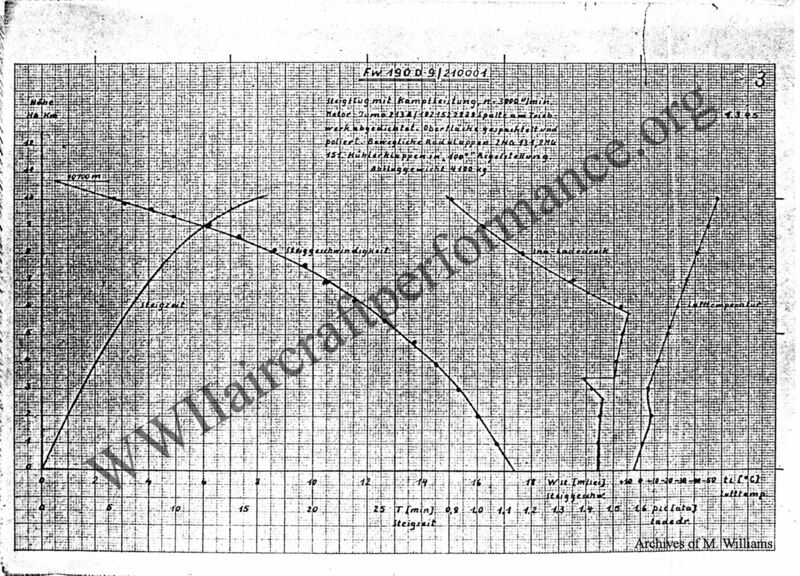 The following chart depicts level speed performance as calculated by Focke-Wulf along with the results presented in Report 3 of Wk Nr. 210002. The condition representative of standard production Fw 190 D-9’s during 1945 is as follows: Jumo 213A operating at 1.8 ata with B4 fuel & MW 50, equipped with ETC 504, main wheel fairing doors absent/fixed and engine gap not sealed. 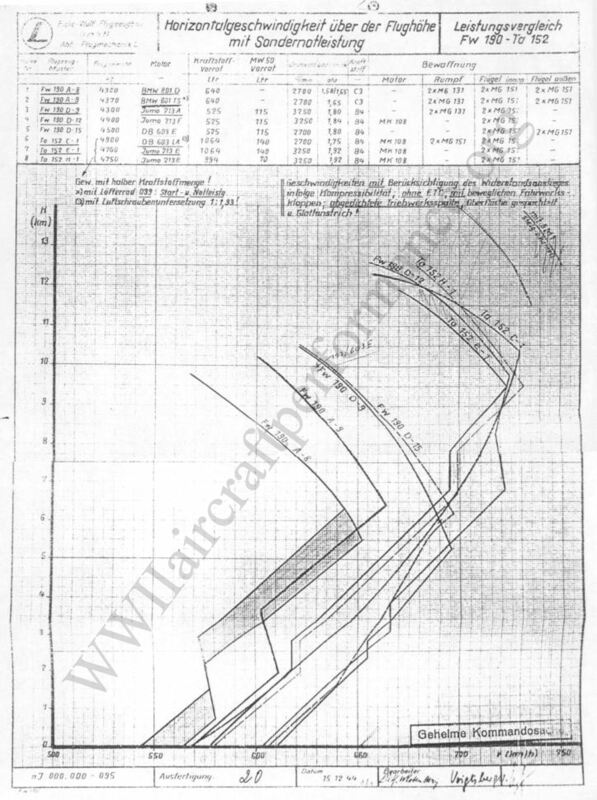 Of all the data charted in the compilation curve linked above, that curve best fitting the condition of a standard production Fw 190 D-9 is curve 4 of the Focke-Wulf Fw 190 D-9 chart dated 11.3.45 (the red line). 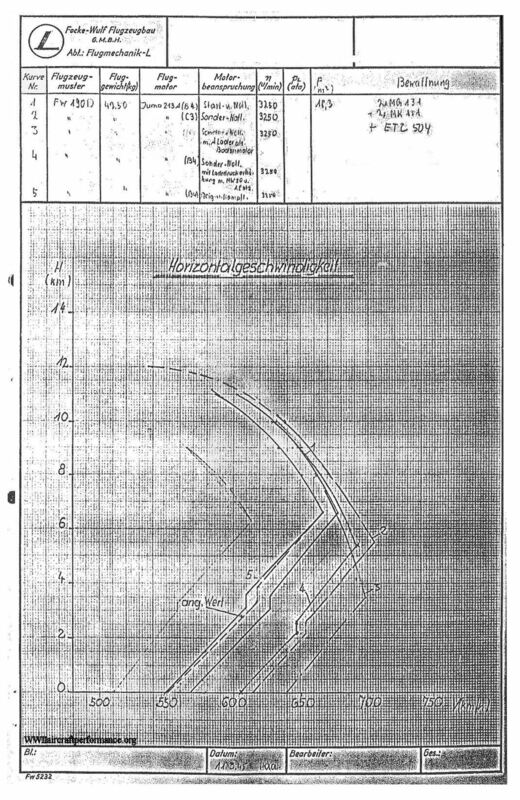 One shortcoming of this curve, when viewed in context with other curves from Focke Wulf’s Flugmechanik Department, is that it assumes the installation of the engine gap seal and is therefore approximately 13 km/h optimistic relative to the condition of delivered production aircraft (with rack minus the drop tank). I haven’t read or heard that the D-9 was tested with the Jumo 213 and C3 fuel. I know that at the beginning of development Focke-Wulf made a distinction between the normal Jumo 213 and the Jumo 213 with 100 octane fuel. I think that there was not a problem with the engine; rather there was a problem of the fuel’s availability. 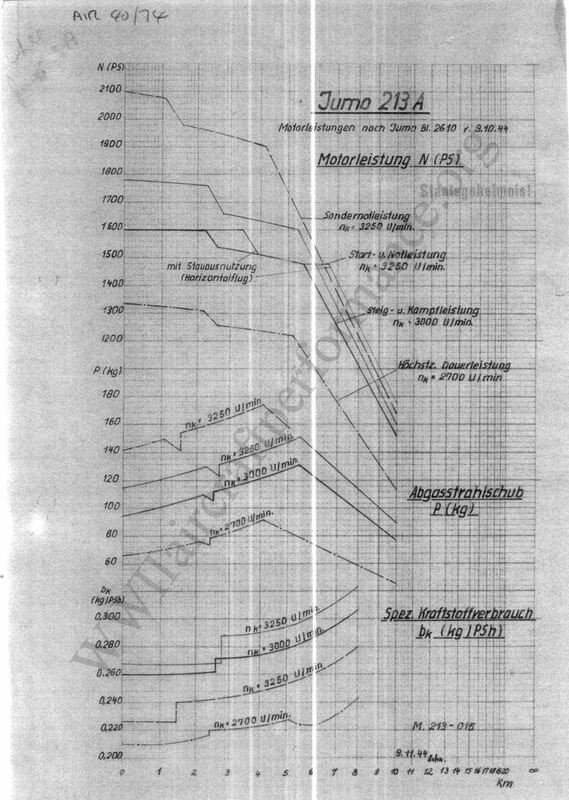 In my book I have published one chart from 3.1.45 (page 154) showing FW 190 D-9 performance with B4 fuel with MW 50 injection operating at 2,02 ata (Sondernotleistung ). However, I have no evidence showing that 2,02 ata was enabled by the end of the war. I think that the D-9 was flown either with the 1900 PS update or with MW50 injection (2100 PS). The development announcement of the D-9 said that all D-9 were delivered with the ETC 504 and the 170 l or 300 l drop tank (Entwicklungsmitteilung Fw 190 D-9, Blatt XV b2 and b3 from 31 May 44 and renewed at 20 June 44). 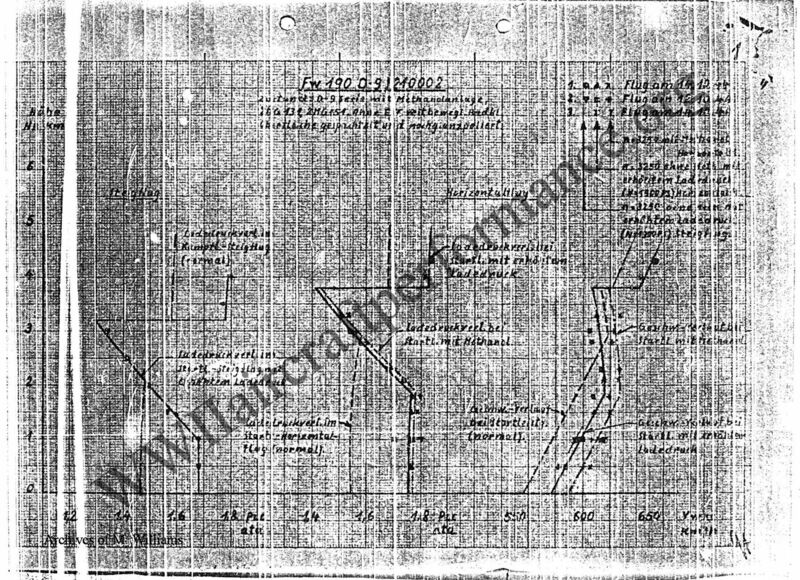 The first test report of FW 190 D-9 serial number 210002 states that the D-9 lost 8..10 km/h. with the ETC 504 and the fixed wheel flaps (delivery condition). D-9 production aircraft did not have the slit sealing (engine gap seal). I have the information from a document named "Lfd. 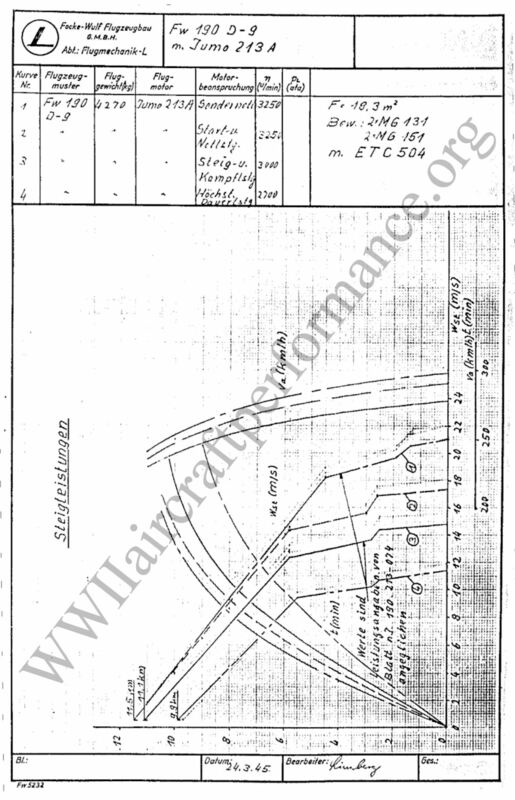 Entwicklungsarbeiten Fw 190/Ta152" from 8.1.45 updated 20.3.45 with the handwritten statement "24.3. Rechlin lehnt ab!". So I think that this was the expected answer about the previous troubles during the Focke-Wulf testing. (Test report No. 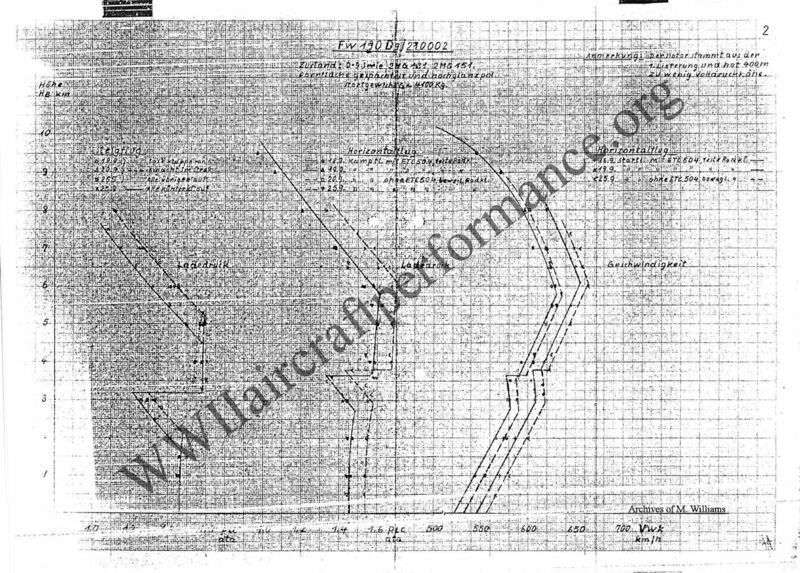 3 of Fw 190 D-9 210002 dated 24.10.44 shows a 13 km/h difference at SL operating at 1.8 ata between aircraft with sealed and unsealed engine gaps (595-608) - Ed.). Flight Report Nr. 4 of Fw 190 D-9/210002 presented the following results: Operating at 1,75 ata, a maximum speed of 606 km/h (376 mph) at ground level was obtained. The maximum speed in the first gear was 650 km/h (404 mph) at 2,7 km (8858 ft.). The condition of the aircraft was as follows: D-9 production condition with methanol installation, surface smoothed/primed and polished, seams & cracks sealed, operable wheel flaps, gap at engine sealed (D-9 Serienzustand mit Methanolanlage, Oberfläche gespachtelt und poliert, Spalte abgedichtet, bewegliche Radklappen, Spalte am Triebwerk abgedichtet.) These values did not quite reach the characteristic curve from the comparison dated 15.12.44. 606 km/h (377 mph) at sea level with MW 50 injection and engine sealing; without ETC 504 and variable wheel covering. 591 km/h (367 mph) at sea level with MW 50 injection; without engine sealing, ETC 504 and variable wheel covering. 581 km/h (361 mph) at sea level with MW 50 injection, ETC 504 and fixed wheel covering; without engine sealing. 578 km/h (359 mph) at sea level without engine sealing and variable wheel covering. 568 km/h (353 mph) at sea level with ETC 504 and fixed wheel covering. In the beginning only the Fw 190 V17/U1 and Fw 190 V53 prototypes were available for extensive flight testing. The V53 was used for performance trials at Lanenhagen. For the most part these confirmed the estimated performance figures. The V53's armament initially consisted of two MG 131 machine-guns in the fuselage, two MG 151 cannon in the wing roots and two MG 151s in the outer wings. This was the armament originally planned for the production D-9s. The outer wing cannon were later removed. The V53 was painted in a standard camouflage finish. At a gross weight of 4070 kg with ETC 503 external stored rack, the V53 achieved 555 km/h at ground level at 3,250 rpm (emergency power). During flight trials the V53 was involved in a heavy forced landing. It was subsequently repaired, but for safety reasons it was limited to low-level flights. When production began, aircraft from the production line joined the test program. The first and second aircraft from the Sorau production line were flown to Langenhagen to participate in series testing. Werknummer 210 001, manufacture's code TR+SA, made its first flight on 31 August with chief test pilot Hans Sander at the controls. On 7 September 1944, just a few days after the D-9 arrived at Langenhagen, the first case of engine trouble was encountered after just four hours flying time. This aircraft underwent four engine changes by 9 January 1945. Even the Jumo 213 A had teething troubles. The second aircraft, Werknummer 210 002, TR+SB, followed on 15 September 1944. The aircraft was piloted by Hauptmann Schmitz on its initial flight. These two production aircraft were used by Focke-Wulf at Langenhagen for long term testing until March 1945. While 210 001 was to have been made ready for delivery to the Luftwaffe in March 1945, 210 002 was scheduled to take part in further performance trials. The fourth production machine, Werknummer 210 004, TR+SD, was assigned to the E-Steel Rechlin, but crashed there on 25 September 1944. The exact cause of the crash remains a mystery. Another Fw 190 D-9, Werknummer 210 007, TR+SG, which had been used for static and air gunnery trials at Tarnewitz, was assigned to Rechlin as a replacement. On its arrival at Rechlin, however, 210 007 made a crash landing (10% damage) and subsequently had to be repaired. Rechlin was subsequently assigned the sixth production aircraft for further testing. The ninth production aircraft, Werknummer 210 009, TR+SI, was flown from Sorau to Langenhagen on 18 September 1944. After just a few test flights, on 26 September this D-9 was transferred to Jumo in Dessau to serve as an engne test-bed. Flight tests were still being carried out there in March 1945, including some with four-blade VS 19 propeller that was to be used on the Ta 152 H.
It was originally intented that two aircraft should be converted to test the Fw 190 D-9 with the MW 50 system. The company planned to convert Werknummer 210 002 at Langenhagen and Werknummer 210 048 was equipped with the system in Sorau. The machine was supposed to go to Rechlin for testing of the MW 50 system, however, it crashed at Sorau while on the third flight. Pilot Finke was killed. In spite of this, testing of the MW 50 system continued on the ground. Interestingly, the special tank was filled with water only, as no methanol was available. Estimated maximum speed at ground level without methanol-water was 540 km/h at 3,300 rpm and 1.5 atm of boost. With methanol-water, maximum speed at ground level was 585 km/h at 3,300 rpm and 1.76 atm boost. In production aircraft it was planned that the MW 50 system could be used to draw fuel or methanol/water from the 115-liter tank. On account of delivery difficulties, however, it was decided to use the tank with methanol-water only, and this was dubbed the "Oldenburg System" (see III./JG 54). This system was installed in production aircraft beginning in November 1944. The first thirty production aircraft were delivered to the unit (III./JG 54) at the beginning of October 1944. [...]In September 1944 an equipment kit was installed which raised boost pressure and increased the Jumo 213 A's emergency output from 1,750 to 1,900 h.p. The installation was carried out on-site by Junker's Tecnical Field Service (TAM). This increased emergency power could be used at altitudes to 5000 meters. At the same time, use of takeoff power (1,750 h.p.) was extended to 30 min., while authorization was given to use combat power (1,620 h.p.) without restriction. The Junkers technical field service visited III./JG 54 monthly. In October the number of Fw 190 D-9s on strength with the Gruppe rose to 68. Of these, 53 had been converted to 1,900 h.p. and one was delivered by Focke-Wulf with the MW 50 system. The remaining 14 were in the process of being converted and completion was imminent. [...]In its November report, Junkers noted that all the aircraft of the three new Gruppe were being converted to 1,900 h.p. and that the work was significantly more difficult at frontline airfields where there were no hangers. 17 December: The Second Gruppe pilots returned to the front and their new base at Nördhorn-Clausheide in seventy-four Fw 190D-9s, their numbers bolstered by twenty brand-new pilots. The pilot’s opinions of the “long-nosed Dora”, or Dora-9, as it was variously nicknamed, were mixed. The new model was intended to correct the Fw 190’s most glaring weakness, its poor high altitude performance. What came out of Kurt Tank’s shop was a compromise. Tank did not like the liquid-cooled Jumo 213A engine, but it was the best choice available. The long in-line engine had to be balanced by a lengthened rear fuselage to maintain the proper center of gravity, making the Fw 190D four feet longer than the Fw 190A. The new airplane lacked the high turn rate and incredible rate of roll of its close-coupled radial-engined predecessor. It was a bit faster, however, with a maximum speed of 680 km/h (422 mph) at 6600 meters (21,650 feet).Its 2240 horespower with methanol-water injection (MW 50) gave it an excellent acceleration in combat situations. It also climbed and dived more rapidly than the Fw 190A, and so proved well suited to the dive-and-zoom ambush tactics favored by the Schlageter pilots. Many of the early models were not equipped with tanks for methanol, which was in very short supply in any event. At low altitude, the top speed and acceleration of these examples were inferior to those of Allied fighters. Hans Hartigs recalled that only one of the first batch of Dora-9s received by the First Gruppe had methanol-water injection, and the rest had a top speed of only 590 km/h (360 mph). 18 December: The First Gruppe reported a strength of 52 190As and 28 Fw 190 D-9’s… The Second Gruppe flew its first mission in its Dora-9s, but failed to contact the enemy. 23 December: The Second Gruppe flew its first Fw 190D-9 mission. 24 December: The first combat mission for the new Fw 190 D-9s of the First Gruppe was an attempted interception of the heavy bombers. 25 December: The First Gruppe reported in the morning that only nine of its Focke-Wulfs were serviceable. The Stab and the 2nd and 3rd Staffeln were taken off operations to train in the Fw 190 D-9. III/JG 54 returned to the combat zone, still led by Hptm. Robert Weiss, a member of JG 26 back in the glory day on the Kanalfront. […] The unit had been built up to its full strength of sixty-eight FW 190D-9s. 26 December: The biggest news the returning pilots had for their comrades was the Mustang’s superiority in speed and acceleration to their Dora 9s. 27 December: Despite its long absence from the front for training, there were still doubts as to the combat-worthiness of III/JG 54. Today a familiarization flight over Münster basin was ordered for all four of the Staffeln. […] III/JG 54 lost five aircraft destroyed and one damaged; three pilots were killed and two were injured. 29 December: The First Gruppe stood down to conduct intensive training in their Fw 190D-9s; 120 flights were made... The Green Hearts were fully engaged today; this would go down in the history of III/JG 54 as its schwarze Tag (black day). As of 31 December 1944 there were 183 FW 190 D-9's on strength with operational units. On 1 January 1945 at least 64 Fw 190 D-9's from JG 2, JG 26 and JG 54 were lost during Operation Bodenplatte. It was recorded by the Gen.Qu. that as of 10/11 April 1945, JG 2 and JG 26 taken together had 138 FW 190's on strength of which 70 were serviceable. Special thanks to Dietmar Hermann for his invaluable assistance. Thanks also to Bryan Bury, Lutz Naudet, and Henning Ruch.